Who best represents authentic Argentine cuisine? 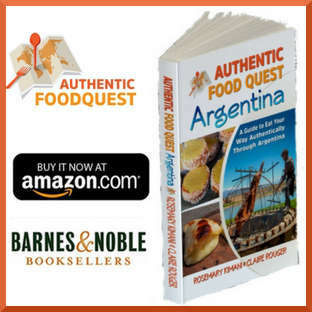 From whom can we learn more about authentic Argentine cuisine? Who knows best about gaucho grilling? The unanimous answer we got was: Francis Mallmann. After reading about Francis Mallmann, and watching his videos about Argentina cuisine and cooking, we were hooked. Francis Mallmann’s personal story as a chef is truly inspiring. As the author of Seven Fires: Grilling the Argentine Way, we wanted to understand these unique grilling techniques in the country famously known for it’s beef. In addition, his focus on authenticity and his return to Argentine cooking roots was another reason we wanted to connect with him. 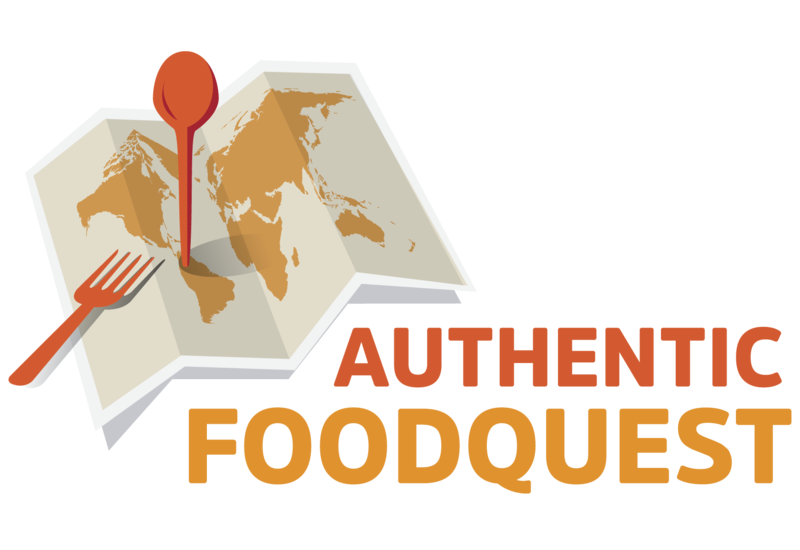 Indeed for us, when we talk about Authentic Food Quest, we define it as: the search for real, simple and traditionally rooted food. When we were in Buenos Aires, we decided to reach out to Francis Mallmann with a simple request for a conversation about Argentina cuisine and authentic food. We didn’t expect a quick response and were pleasantly surprised when Francis himself not only responded but also invited us to meet with him. 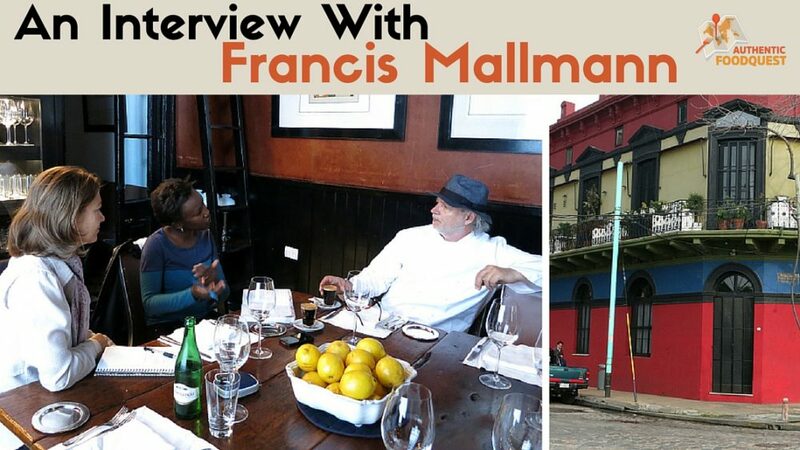 Four days later we were sitting at Patagonia Sur restaurant in La Boca, Buenos Aires, talking to Argentina’s most renowned Chef, Francis Mallmann. But before we dive into the heart of our discussion, let’s us take you to Patagonia Sur Restaurant in La Boca. La Boca is a popular neighborhood located on the Southeast side of Buenos Aires where European immigrants originally settled. Today, it is a working-class neighborhood with patches of touristy attractions. Patagonia Sur is about one block away from the famous colored El Caminito street. When we got to the restaurant, we were surprised to see that the outside was not the fancy superstar chef restaurant we expected. Instead, we found ourselves standing behind a closed black door at a nondescript building, waiting to go in for our meeting. When we walked into the modern and rustic restaurant, we were surprised to see only one table set up. We looked around expecting to see additional tables around the corner and that’s when we learned that it is a one-table restaurant. Francis told us that Patagonia Sur is a very intimate restaurant where a maximum of two or three tables can be set up for a meal. That day, there was only one elegant table set up for dinner that night. We started our conversation by talking about the culture around food in Argentina. Francis told us “one of the biggest qualities of Argentinian life is the time we have we invest in sharing meals with family and friends. Lunch is important. Dinner is important and you sit down for lunch and you sit down for dinner. And you talk and after lunch or dinner you spend an hour talking about something. But the biggest quality of Argentina for me is that feeling of sharing a meal. And that is the true reason to eat and drink something delicious. Is to share. For me it is the only reason. Food is about enjoying delicious food and wine. And talking to your pairs, friends, lovers, whoever they are and having a nice conversation. Given that Argentina is famous for its beef, we asked Francis to share with us his world-renowned approach to cooking with the fire and the Argentinian grilling experience. We went on to discuss the future of cooking. From the point of view of Francis, he expects to see a return of authenticity in cooking. In addition to discussing Argentine cuisine, we took the opportunity to also discuss the Argentine specialties not to miss. This conversation with Francis helped shape our itinerary for our quest for authentic food in Argentina. Our conversation left us fueled with a desire to experience gaucho grilling and visit the Andes where the vegetables and fruits struggle to survive. After leaving Buenos Aires, our first stop was Mendoza where thanks to Francis, we had the opportunity to experience the seven fires at The Vines of Mendoza. Our trip continued to the Northwest of Argentina. We also went south to Patagonia and the Lake Region, discovering the local and traditional dishes. We met with Francis Mallmann shortly after Netflix portrayed Argentina’s top chef on Chef’s Table. Coincidentally, stars started popping up at Patagonia Sur Restaurant in Buenos Aires, after we met with him. It was funny to receive articles and photos, from our Argentinian friends, of Francis Mallmann with stars like Katy Perry and Gwyneth Paltrow. We ended up watching the show several months later. If you haven’t done so, we highly recommend watching the Francis Mallmann episode on Chef’s Table. More than a Chef’s show, this episode is very inspirational. It conveys Francis Mallmann’s personality and connection to food and nature. Watching the show took us back to our meeting and our memories of Mallmann’s passion about Argentine cuisine and cooking. Enjoyed reading this article? 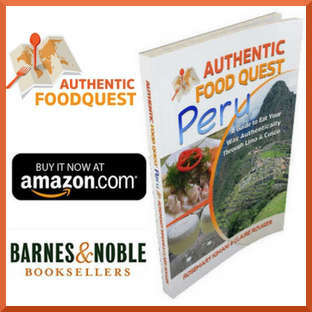 Read more about the authentic foods in Argentina we discovered in our Amazon Bestseller book: Authentic Food Quest Argentina: A Guide to Eat Your Way Authentically Through Argentina. Available NOW on Amazon Kindle. This is a really great article on this traditional food of Argentina! Love to read the interview learn more about the gaucho gastronomy & see the importance of using ancestral techniques that have been in this area for centuries! Thank you so much Cristina for your comments. It was truly an honor to have the opportunity to meet Francis Mallmann and learn more about Argentine cooking and cuisines from his perspective. So glad you liked the article. I spent 2 weeks in Buenos Aires last year and the majority of the time was exploring La Boca. What a beautiful but grungy neighbourhood. Excellent interview! I thinking a saw Chef Mallman in an episode of an Anthony Bourdain show. I love Argentine parilla! Thanks Adonis for sharing your experience in Buenos Aires. 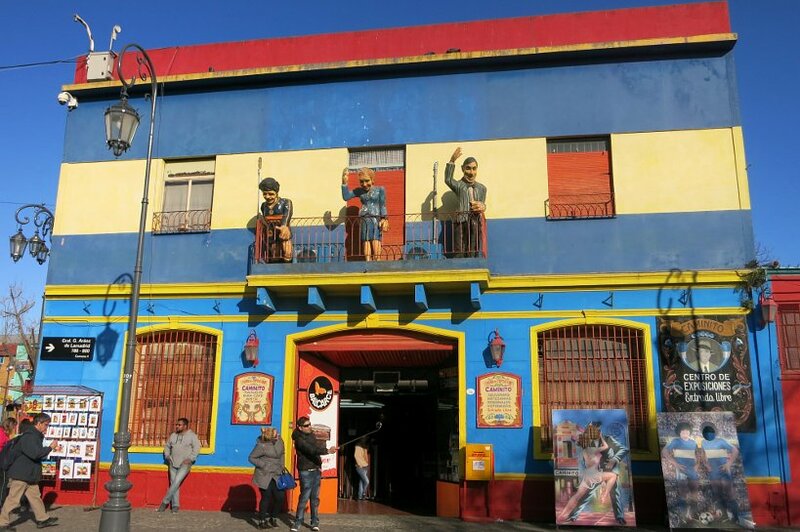 Like you, we enjoyed exploring the different neighborhoods including La Boca. The neighborhoods are all quite unique. So glad you enjoyed reading the interview. Great guy and amazing chef. You are right, can’t beat Argentine parillas 🙂 Thanks for your comments. So glad you enjoyed reading the interview. Indeed, going with the local rhythm and eating hours can be a challenge. Our experience was that Argentines eat late and wake up late. Making that adjustment helps. Hope you able to be flexible with your hours. Eating with the locals is a great experience. 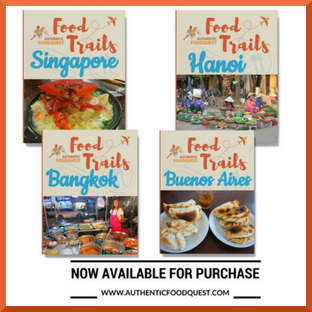 Safe travels in September and feel free to pick up our book, Authentic Food Quest Argentina. Cheers. 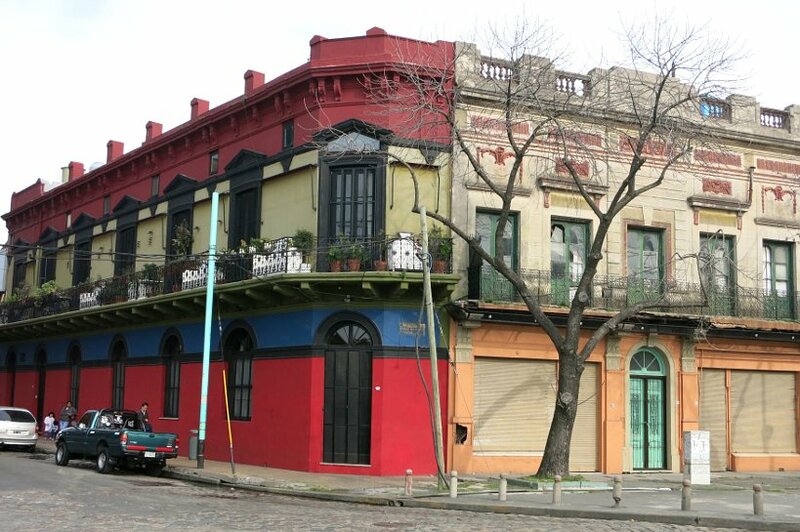 The building paintings on El Caminito Street, La Boca look way too good! Really can’t wait to discover Argentina and try some delicious cuisine. Really great you had the chance to meet up with him. We appreciate your comments. Thank you. Hope you are able to make it to Argentina soon. 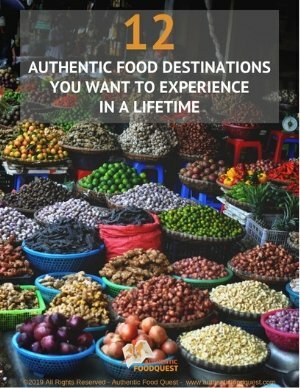 Fantastic country with amazing cuisine. Cheers! 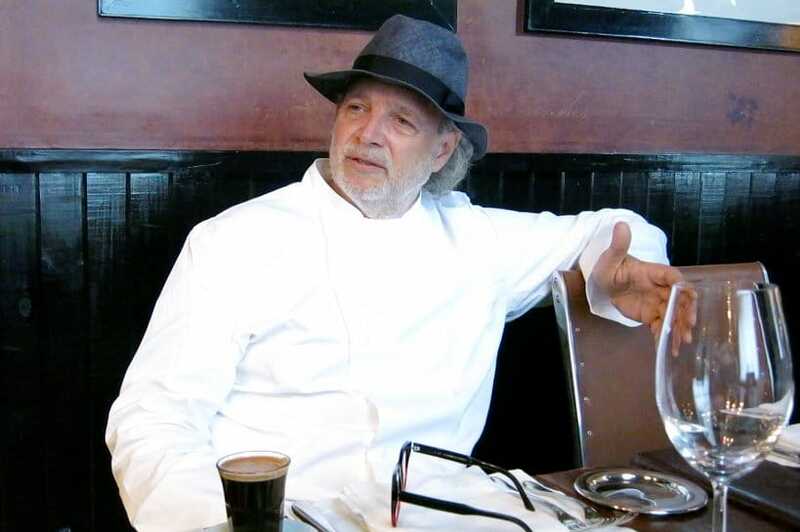 So cool that he invited you to meet with him – will definitely check out the Francis Mallmann episode on Chef’s Table. Thanks for sharing your interview with him – I love how the Argentine culture places importance on eating and sharing a meal with family and friends. That’s the way it should be! Thanks Meg, so glad you enjoyed reading the interview. 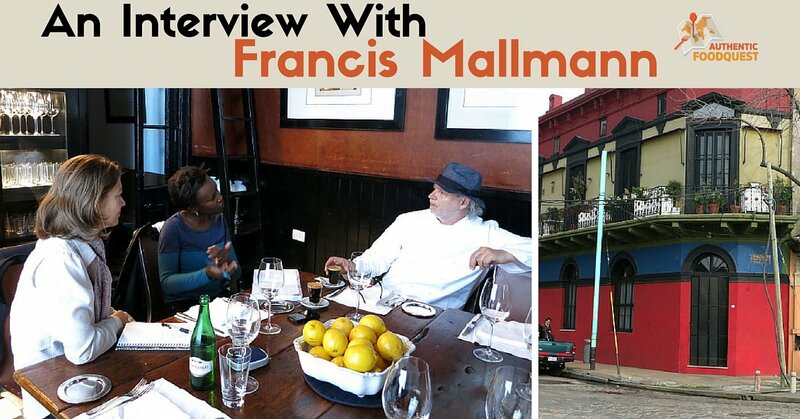 Do check out the interview on Chef’s Table, you will enjoy getting to know Francis Mallmann. We were also struck by the emphasis on eating and sharing meals with friends and family. I hope you have a chance to experience an asado on your trip, you will experience and feel that closeness. Pretty amazing culture. Thanks for your comments. The true reason to eat and drink is enjoying conversation and the sharing of a meal, I love that. I would have been so surprised as well at only one table setting! Very heartwarming and inspirational. We are so glad Mar that you enjoyed the interview. 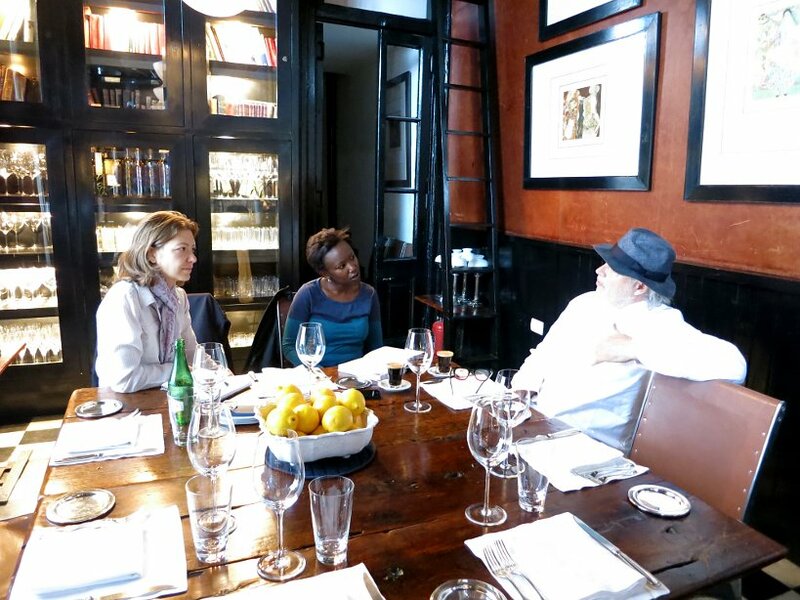 It was really a pleasure to meet with Francis Mallmann at his surprising one table restaurant 🙂 Agree, food is about sharing and connecting!! Appreciate your comments. I loved when he talked about how important a meal in terms of being with friends and family. I totally believe that meals should be enjoyed together and at a table! It’s a great time to build relationships and talk without social media and TV blasting! You are so right Anita, food and time spent sharing is sacred in Argentina. TV’s, mobile devices and social media don’t have a place on the table in Argentina. It is about sharing and spending time together over delicious foods and wines. Francis Mallmann is truly quite inspiring!. Thanks for your comments. The Patagonia Sur Restaurant sounds like a fabulous place for a special meal out in Buenos Aires, so i will definitely put it on my list of places to visit. You will not be disappointed at Patagonia Sur. The only advice we would give is to make your reservations in advance. It is a fabulous and intimate restaurant. The perfect place for a special occasion. Thanks for your comments. I am SO happy to come across this, I watched a Francis Malman program on Netflix and how passionately he cooked. I want his Patagonian lifestyle – you are so lucky to have interviewed him. I am an Argentina fanatic and I think I ate at a parilla twice per week and an empanada a day. Thank you for your comments. 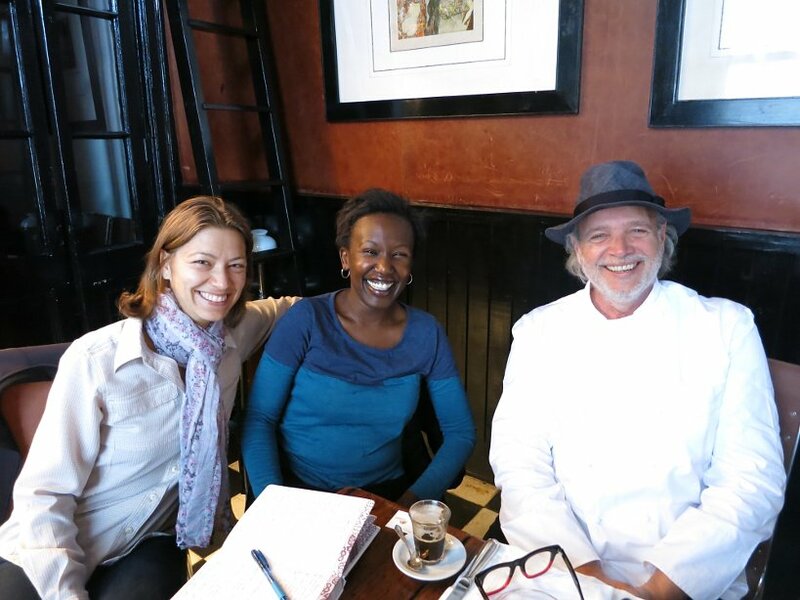 We are so glad you enjoyed reading about our meeting with Francis Mallmann. He is truly a great guy. It was nice to see that the man we met is the same person portrayed on the Netflix show. Authentic and real! That’s funny how much you ate at parilla’s and empandas…lol!! We can relate. On day two in Argentina, we got the “empanada addiction”. So much good food. Delicious!! I agree entirely with Francis, that there is no better meal than one shared with the people you care about. As a solo traveler, those opportunities are few and far between, but I cherish the ones I do have. 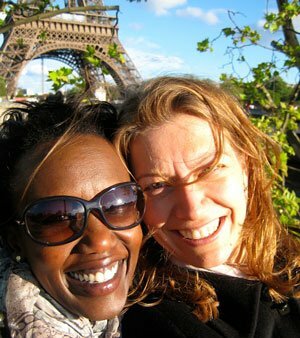 And of course, I’m always hoping to meet new people through travel! Thanks John for your message. Sharing meals with loved ones and new friends on the road is a wonderful gift. Wishing you lots of delicious meals on your travels! 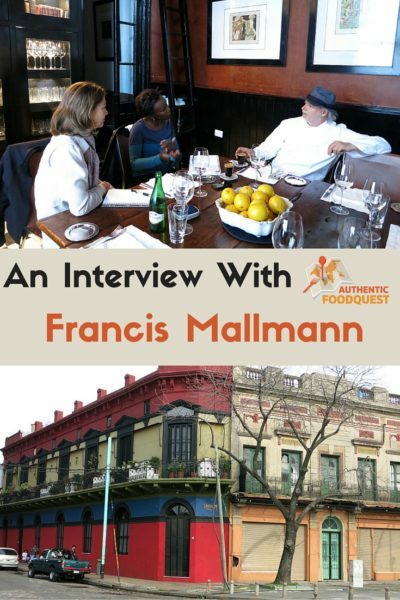 Glad you enjoyed reading the interview with Francis Mallmann. Cheers! Wonderful you were able to meet him and he is so humble! Did you eat at the restaurant? Yes Cathy, we ended up eating at his restaurant in Mendoza, called Siete Fuegos. Really amazing experience! Great post and an inspiring interview of Francis Mallmann.﻿. It was nice to know on the traditional food of Argentina. Looking forward to watch the show. Thank you for so much and glad you enjoyed the post. Do watch the show when you have a chance 🙂 You will enjoy learning about Argentine food culture. Cheers! Fascinating about having only 1, 2, or 3 tables. My stomach is grumbling now. Great read!I love that they still value a shared meal with friends as an every day tradition. Taking the time to eat, enjoying the food and company has always been something I appreciate. So true. Unfortunately, taking time to enjoy meals is not all that common any more. Love that it is very much a part of the Argentinian culture. So glad you enjoyed reading the article. At El Garzon, we took over the square where this restaurant is, and we set up a whole block of fire from one corner to another. And one of the most fun things in that time was cooking for the president of Uruguay I was doing basically all the chef work, and he trusted me and gave me the chance to grow. The beer behemoth’s merger will create lots of redundancies — another reason to support independent breweries. Thanks Colby for your comments. That’s great what you were able to accomplish at El Garzon in Uruguay. What a fantastic experience to cook for the president of Uruguay. We look forward to coming back to Uruguay and visiting the restaurant. Cheers! This seems to be quite a great place to hang out with friends and family.